Capable of taking you from random wintry nights at altitude to sub-zero climes, this versatile North Face mummy bag is insulated with 600 fill ProDown™ that's water-resistant to maintain loft and warmth, even if you're camped amidst serious spring showers. Capable of taking you from random wintry nights at altitude to sub-zero climes, this versatile North Face mummy bag is insulated with 600 fill ProDown™ that&apos;s water-resistant to maintain loft and warmth, even if you&apos;re camped amidst serious spring showers. The North Face uses only the highest quality goose down in all of its products. Each lot of down is thoroughly tested at three stages of production for loftiness, moisture resistance and ability to regain loft after compression. The fill per of goose down is an indicator of two important fetters: the warmth-to -weight ratio and compressibility, both critical tot he user&apos;s warmth and comfort True fill power is measured by placing on ounce of down in a graduated cylinder and measuring the volume the down occupies ion cubic inches. The North Face products are insulated with exclusive, high-fill-power down ranging form 550 fill to 900 fill, which represents the highest quality down commercially available. 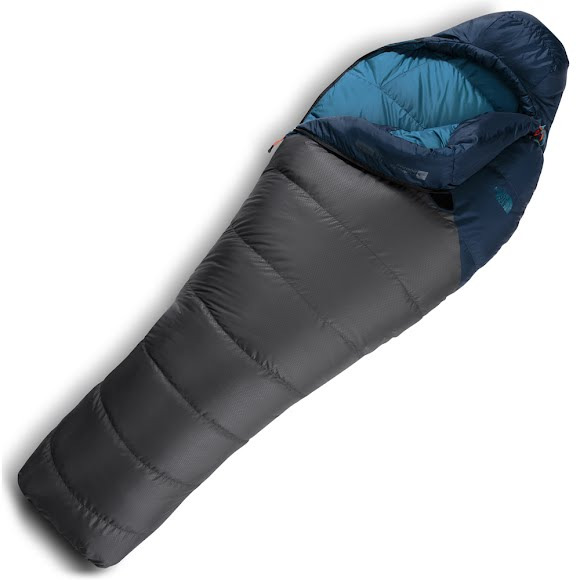 Down is the warmest, lightest and most compressible insulation available, but when it gets wet, down clumps, stops insulating and takes a long time to dry. Water resistant down is a natural down insulation enhanced with a hydrophobic finish that keeps the down plumes from becoming saturated with moisutre and losing their insulation value. Water resistant down stays drier longer and dries faster than untreated down, improving its performance and versatility in a wider range of weather conditions. Certified to the Responsible Down Standard (RDS) by Control Union. The RDS ensures that our down does not come from animals that have been subject to any unnecessary harm, such as force-feeding or live-plucking, and helps track the down used in our products from farm to finished garment. The fill power of goose down indicates two important features: the warmth-to-weight ratio and compressibility. Our products are insulated with exclusive, high-fill-power down ranging from 550 fill to 950 fill, representing the highest-quality down commercially available. Heatseeker Eco is a high performing insulation made of 100% recycled polyester fiber. Highly compressible with a great warmth-to-weight ratio, it&apos;s extremely resilient, water repellent and hypo-allergenic. Because it&apos;s made entirely from recycled materials, Heatseeker Eco is a carbon friendly choice for the environment. At the same time, it is still subject to the rigorous test standards and specifications befitting the exceptional tradition of Heatseeker.